October 1st is Vegetarian Awareness Day and it continues all month. 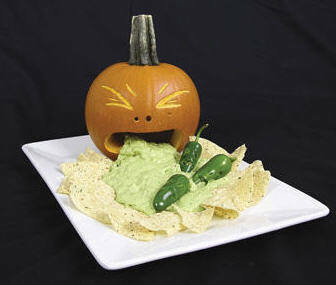 Scare up some Vegetarian Halloween Food. Monster Food – Eyeball Caprese for brave of appetite. 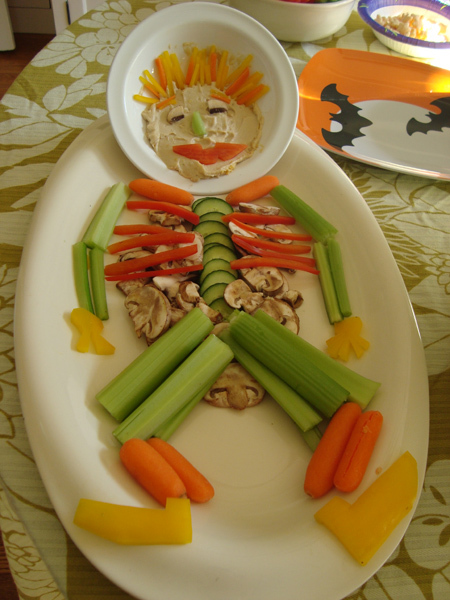 Photo Credit: whitneymoss for this edible Bony Maroney Skeleton. No meat on the bones here. Visually dissect the skeleton for a list of ingredients. Hint: hummus face. Puking pumpkin…… What can I say? If you’ve just gotta have your meat, disguise it in a Mummy Meatloaf and we won’t tell. Mum’s the word. This is a little bit more advanced project, but Wow, how fun would this be to surprise someone with the smashed wicked witches legs sticking out from under the bed? Diary of a Crafty Lady will show you how. Our work day ends as Twins fan Devon throws on her jersey and heads off to the new stadium. Lisa chooses to cross the Mississippi River to St. Paul for a Wild’s game. Devon now reports on how she helped the Vikings win “we got out our Vikings blanket, and wore different outfits, and I painted my nails purple, which worked last year.” Do you know of others with these powers? What do you get when you divide the circumference of a pumpkin by its diameter? Pumpkin pi. Teaching responsibility is a parents responsibility, right? At what age do we begin this challenge? And it is a challenge. 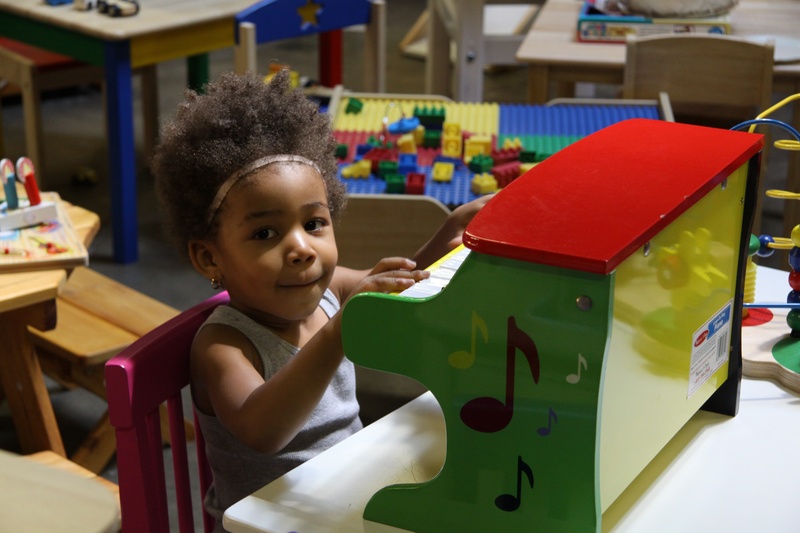 By age two, there are little chores such as delivering their dishes from the table to the sink, helping put some of their clothes in a dresser drawer or putting toys in a toy box. These are the easy years when little ones are eager to please and love mimicking big people tasks. Learning to dress themselves as soon as they are old enough will be a milestone. Then, the tough chore of teaching that clothes do not get dropped in a pile on the floor or used for making a trail through the house, but soiled clothes go in the hamper. Wishing you luck – lots of luck. More than luck, it’s dedication to your responsibility. Inevitably your two year old’s eagerness will wane and the fussing begins. We found working together as a parent child team with chore games or the responsibility chart is a huge help with motivation. It is easy to fall into the trap of thinking it is just plain faster, easier and less frustrating to do the little tasks yourself, but DON’T fall for that temptation. This is the opportune time to teach the life important responsibility skills that will be harder and harder to teach when they have developed irresponsible behavior patterns. Please let us know if you have winning tricks of the trade to pass on to other parents. Do your children have chores? What ages are they for the chores that they are doing? Tin Can Pumpkins Martha Inspired. Recycle your cans and light up the night. Looks like another family friendly project for us to try. Can you tell we love this holiday? These creatures are going to be a must make for us. Can’t wait for the how to lesson from Momfluential Media. Candy Witches Brooms by make and takes claimed to make you cackle. I especially like the brooms with the foil removed. Must be the sight of chocolate. This clever treat even the youngest child could help make. Our Hallo-Green Party was a huge success and now there is a rack full of Halloween Costumes available for you right up to Halloween. 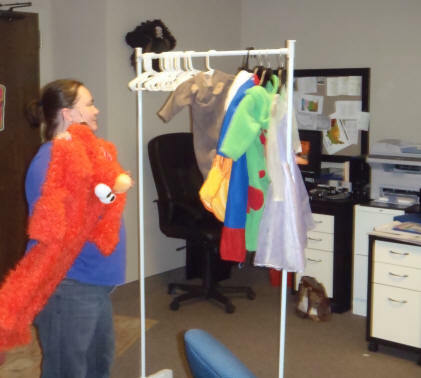 Bring in a child’s costume to exchange for a “new to you” Halloween costume. Also a reminder that we have Shrine Circus tickets to give away this week. Free Halloween Coloring Pages – click on witch. An easy Ghostly Halloween craft project to do with your kids that uses only a white balloon, 2 white grocery bags a black marker. If you are hosting a Halloween Party – make your own invitations. Megan, one of our designers, makes her own greeting cards. We will try to have a lesson session with her teaching a creative individualized technique. Wouldn’t these lanterns be perfect to make for Halloween? Halloween Food: Scarecrow Cupcakes – we’re not to scared to give them a try. Some nasty Flu bug has been striking our team. Lisa, Nick and Annie have all taken turns with some form of it over the last 2 weeks. At least Angela is top of the list for her Flu shot. 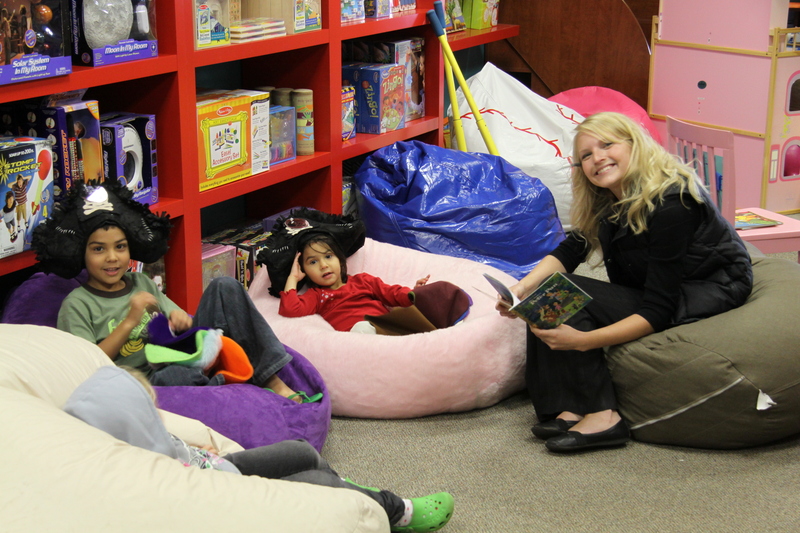 Another Mommy Monday at Totally Kids. Today we will be giving away $15.00 Gift Cards all day to random Twitter followers. There will be a list of winners toward the bottom of this post. If you are selected, just contact us before midnight tonight and we will send you your prize. 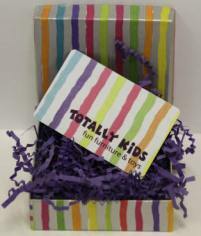 Shop online at www.shoptotallykids.com or visit us one mile from the Mall of America – 7876 Portland Avenue South. 952-881-2425. 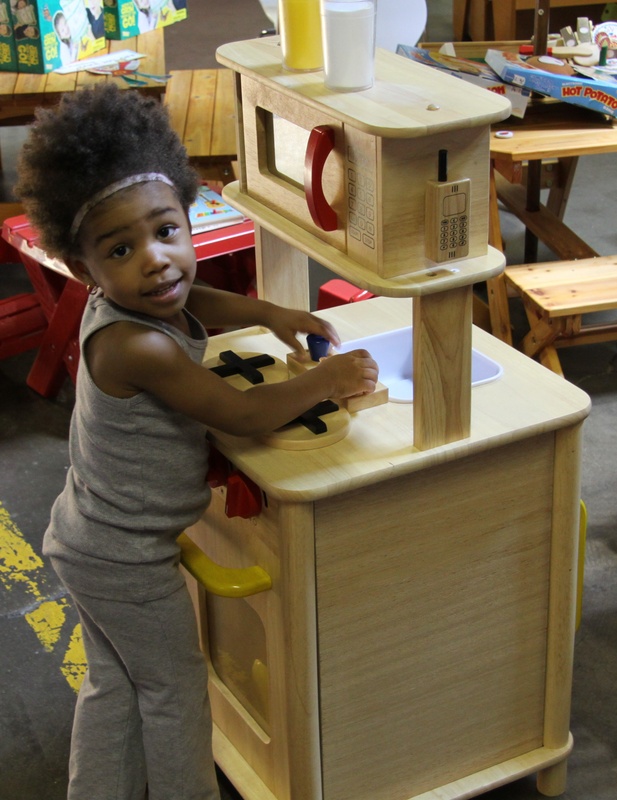 Little Mommy Mariah is cooking up a storm at one of the Totally Kids many pretend play kitchens. We have a new dog joining the Totally Team’s “we love our dogs board”. Because of flooding in southern Minnesota, Shauna drove 4 hours or more last night to get her new cute little Pit puppy Casey. Once we get everyone’s dog photos together we will post them. Wag-O-Ween is coming up soon and we will have wicked doggy photos from that event too. A beautiful crisp sunny day in Minneapolis and the fun and games continue. Last night some vandals had their own style of fun and games. Remember the pumpkins punctuating the purple planters? Shauna arrived this morning to find those pumpkins smashed all over the parking lot. Stephanie, bless her heart, somehow managed to pick up the pumpkin pieces and rearranged them back in the purple planters, almost as good as new. They now look like slightly leaning backward pumpkins sitting the the purple planters. Nicely salvaged, but we will see how long they survive. 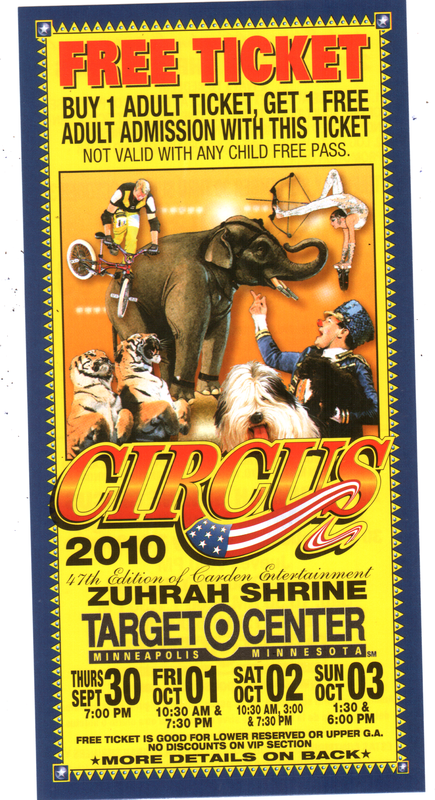 First off today, we will start giving away tickets to the Zuhrah Shrine Circus and will continue for the rest of the week. When you stop by the store just tell us if you would like a ticket. 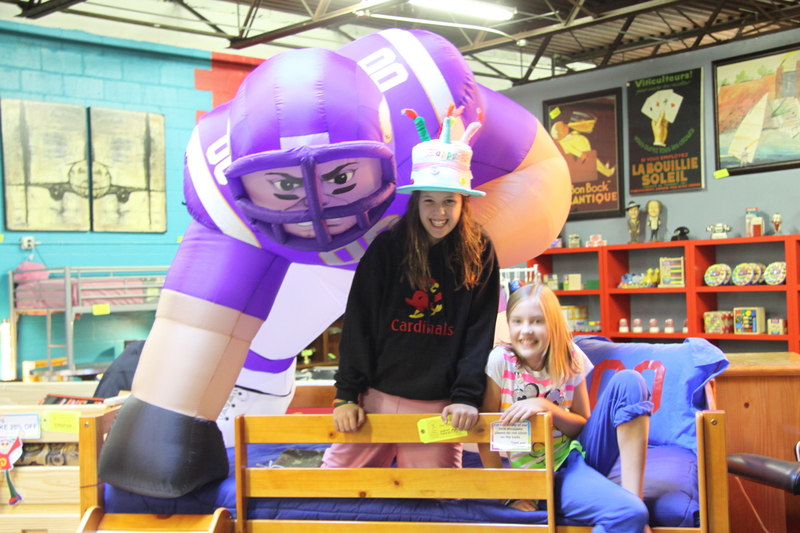 Things do slow down on Sunday afternoons here at Totally Kids when the Vikings are playing. Lisa, our customer care manager never misses going to a home game. Devon must have worn her winning jersey, sat in her favorite chair, or was it something to do with how her two Boxers behave that is crucial for the Vikes to win? This week they won, thanks Devon and dogs. 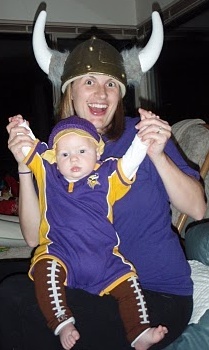 Daddy’s a Packers fan and we know Mommy’s a Vikings fan, just look at her face. Who is Baby O rooting for, Seahawks? Come on Betsy, let’s get him 0n board. Good job with the Vikings garb. Skol Vikings! Learn how to make a Bat Puppet. 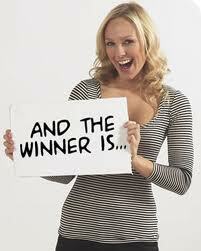 We will be posting pictures this evening and announcing the grand prize winner tomorrow at noon. There were several hula hoop winners and a few skilled young men winning the football pass game. Somehow we ended up with more costumes than we started out with and now have a lovely assortment of Halloween costumes. 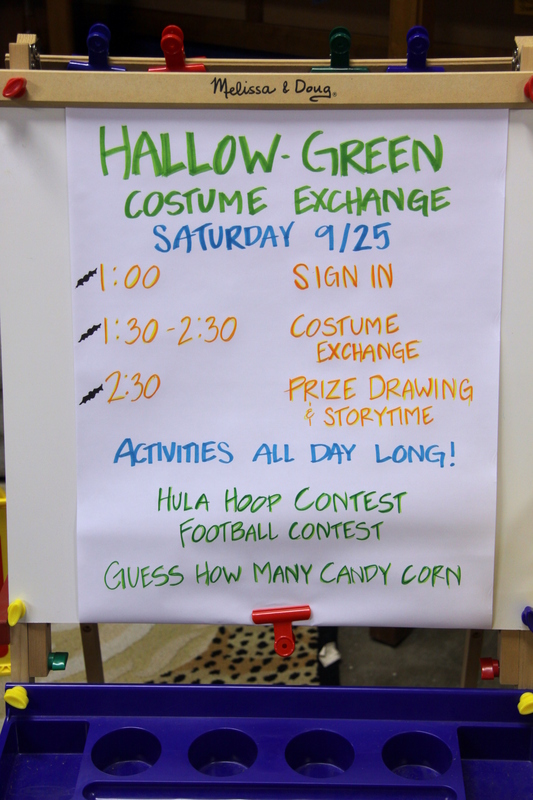 So now the Hallo-Green exchange will continue until Halloween or until further notice. Please tell all of your friends – if they want a cost effective way to outfit the kiddos for Halloween – drop in. Birthday Girl Molly and her friend Emily celebrated at the Water Park of America before stopping by to choose a birthday bed. Molly’s Mom liked the Dixie loft almost as much as the girls did. You must admit that loft looks like it was made for the girls. Skol Vikings and Big Happy Birthday Wishes to Molly! It’s Hallo-Green – so… Who ya gonna call? 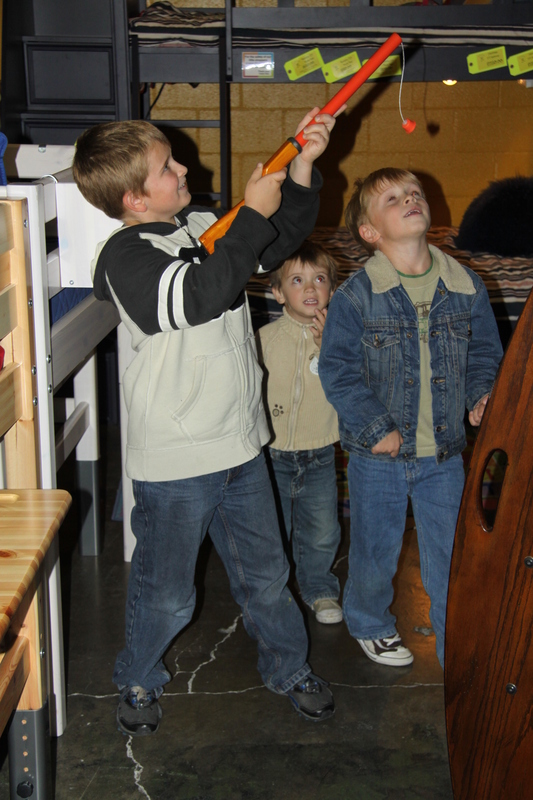 The ghosts over the pirates bed were fair game today when armed with a popgun. 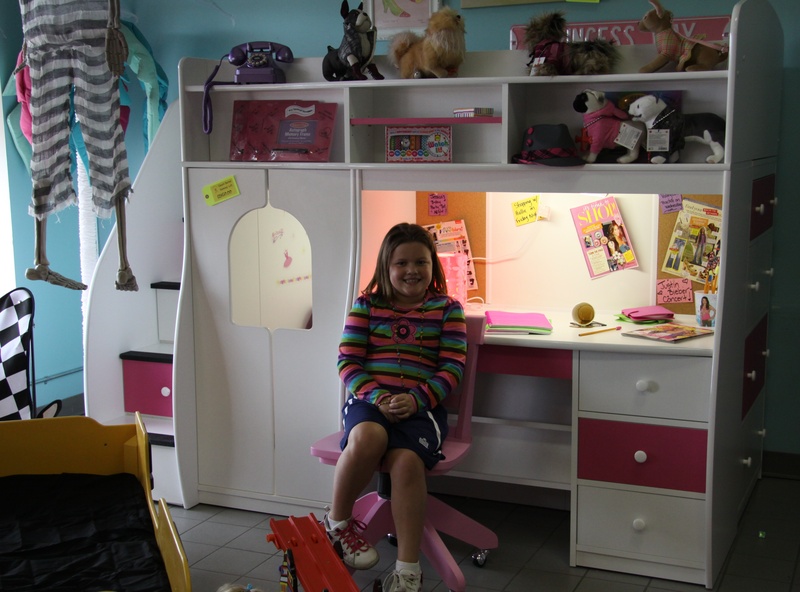 Charming soccer player, Ashley is sitting under the Summit Loft Bed. 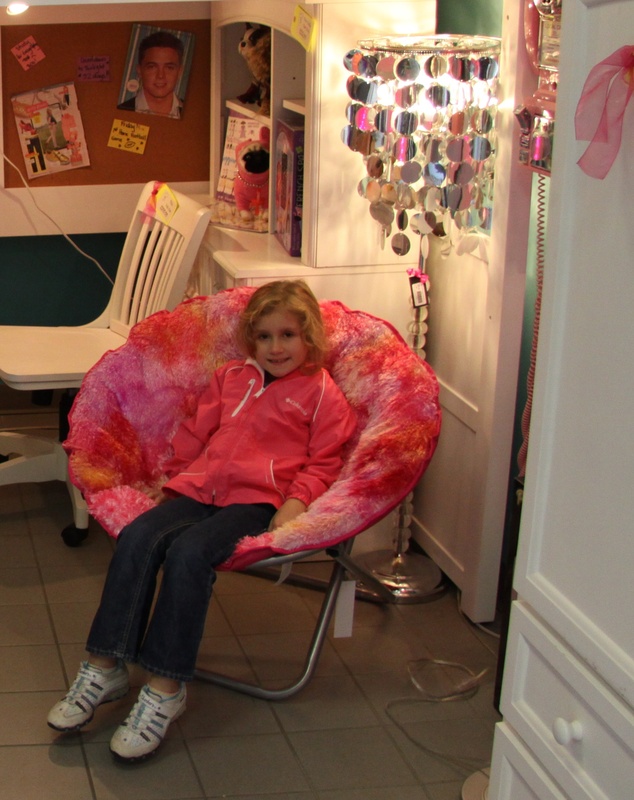 Her sweet little sister is seated in the picture below in a cozy snuggle chair. Siting in front of Elena’s Secret Loft is our cute secret guest. Please let us know if any names are not correct in this post, and to our secret guest, we apologize for not having your name. We hope that you all will join October 23 for our next special event. Today marks the beginning of Fashion Week at Totally Kids. With little time remaining, Devon spent the day in her office preparing her collection for the final cut. Which hauntingly haute couture design will make it on the cover of our phantom magazine? The winner was a red furry number sporting bulging eyes, arms and legs . This design will remarkably transform most anyone into an Elmo. Devon’s costume collection along with the ones arriving tomorrow will be featured at the Hallow-Green Kids Costume Exchange Party. Will there be a cat walk you ask? You’ll just have to stop in to find out. Not only can you exchange costumes for a new to you gently used one, but there are many contests, treats and activities planned. You all are invited to join us. We look forward to seeing you. Heads up friends of Totally Kids! We are having our first ever Friendly Friday BOGO on Toys. This offer is good Friday, September 24, 2010 During business hours 10AM to 6PM. If you need help selecting the perfect toy, our personal shoppers are ready to help. Happy Fall All! We have two upcoming fun events for folks in the twin cities area – so mark your calendars! and drop in for fun and games. Many years have past since rooting for our hometown team has felt so good. The Central Division champs are heading toward the World Series! Could the magic be the new stadium? 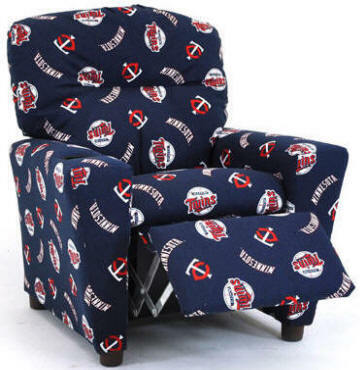 Wave your homer hankies at this major league chair where little fans can kick back in supreme style and comfort while watching the pennant-bound Minnesota Twins WIN. This cool recliner has both a sitting and a reclining position complete with cup holder built into the arm. The reclining mechanism is made of steel, and it has a safety feature whereby the footrest must be pulled out from the bottom before a child is able to recline when seated. It’s a real finger saver – keeping little digits from being pinched in the opening and closing. For all the rest of you out there – NOT Twins Fans, your favorite team chairs are available for you too. And the list goes on…..
Chicago White Socks You’ll score a home run when you surprise your little fan with our Baseball Glove Chair.